Rose becoming a star of stars in L.A. The buzz has officially begun. No, they haven’t planted roses yet all around the Hollywood sign in Los Angeles where they’ll play the NBA All-Star game Friday. But the weekend has just started. Wait a few hours. It seems almost everything is coming up Rose, starting with Thursday night’s 42-point career scoring night for Rose on national TNT, which carries most of the All-Star festivities this weekend. Sure, the fate of Carmelo Anthony, who’ll address reporters early Friday afternoon and the hazy uncertainty of NBA labor negotiations will hang over the weekend. But Rose’s game against the league best Spurs kick started the talk, which seems headed right into the weekend. Just hope the other All-Stars don’t freeze him out. 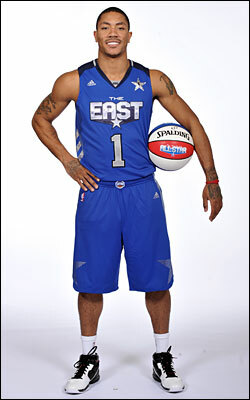 Nah, he’s just too nice, and as starting point guard for the Eastern Conference All-Stars, Rose has the ball. Rose will be starting Sunday in a lineup with LeBron James and Dwyane Wade, which the Bulls felt wasn’t that far away from reality last summer. So Miami, which has been the story of the 2010-11 NBA season both bad and good, is just two games ahead of the Bulls in the Eastern Conference standings. If James and Wade really wanted to win, wouldn’t they be playing with Rose and Joakim Noah? They could have been if they chose to. Now that would have been something to watch. Early Friday morning, I got my regular call to be on Tony Kornheiser’s Washington D.C. based radio program. Kornheiser, an old friend, is the host of the popular and trend setting PTI show on ESPN with buddy Michael Wilbon. Kornheiser loves to light heartedly make fun of Wilbon, a native Chicagoan who had been touting Rose. “Could Wilbon be right and Rose be the MVP?” Kornheiser asked me plaintively. I don’t think Kornheiser is a voter since he’s not a regular NBA journalist. But his show and beliefs impact a lot of what goes on with these kinds of awards. It’s the buzz, the talk on ESPN, the number of highlights, the national TV games. I got calls from Sirius radio and Fox to be on shows to talk about Rose. And that was just by 8 a.m.
USA Today’s Friday supplement for the All-Star weekend features a Rose profile on the front page. Rose, ever humble after Thursday’s game in what those of us around him so often knows is hardly an act, said he never thought about All-Star games and Skills’ challenges and awards. “I just wanted to be in the NBA,” he said. Now he’s become a major part of it. Rose joins All-Stars Friday morning in the league’s Day of Service, when All-Stars and staff fan out across the host city for projects. Rose joins Pau Gasol, James, Dwight Howard–whom we hope doesn’t wield a hammer and “accidently” take out Rose–Dirk Nowitzki, Chris Paul, Deron Williams and Tim Duncan in helping with a playground building project in partnership with Rose’s shoe sponsor, adidas and State Farm. Rose then will attend the interview sessions for All-Stars, which Michael Jordan routinely blew off to play golf and took his $10,000 fine. Though when he was first in the league, Jordan did attend some. Later in the afternoon, Rose will be one of the top players attending a collective bargaining meeting and will go to the rookie/sophomore game Friday night featuring teammate Taj Gibson playing for the sophomores. Saturday there is All-Star practice in the morning—yes, lots of plays—then Rose will meet with commissioner David Stern and players’ association head Billy Hunter regarding more collective bargaining. That evening, he will participate in the skills competition of guards, which he won in 2009. Rose could not defend his title after being injured by Howard in the game before All-Star break last season and basically limping through his first All-Star game. This should be a much different experience. That comes Sunday, after Rose makes an appearance at a show store or his sneaker company and unveiling his new shoe he helped design. It’s, meanwhile, more than a whisper now and more than just the home fans in the United Center. Rose is stepping onto the big stage and the NBA world is scratching its head. Maybe they missed something. Maybe this kid is special. Maybe he is the MVP. Could they have been wrong? Rose seems to show someone that just about every game.